You're not the kind of person to do this, but almost every day you make the decision that faster food is more important to you than healthier, fresher food. You don't want to make these food sacrifices anymore; you want to learn to cook healthy vegan meals that are a bit quicker, easier, and less expensive than others. It seems like the only people who have time to cook homemade meals are full-time homemakers without kids. How can anyone else do it? Students don't have kitchens, new graduates are broke, newlyweds realize they never learned to cook, and working parents have no time to follow recipes. We favor cheap, premade, packaged, take out, and other fast food over cooking from scratch. "I don't have time to leaf through recipes and follow intricate directions." 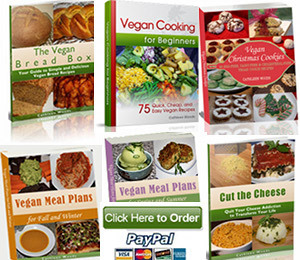 I have a huge, valuable collection of vegan cookbooks from which I've made hundreds of recipes, and they've truly helped me become a better cook. But on a daily basis, I do not use cookbooks. I scrounge through my fridge to see what fresh vegetables and fruits I have, and I design a meal around that. Most of the time I need the meal to be done quickly with whatever ingredients I have on hand. I've done this my whole life. I had a crazy schedule when I was in college, but I still cooked in my tiny hot pot and eventually in my tiny apartment kitchen. I know what it's like to think of a dinner plan while driving in traffic after a long day. For years I watched my mother coordinate soccer carpools and sleepovers and she still had a homemade dinner on the table just about every night I can remember. There are many secrets that keep you from sacrificing quality meals because of your busy schedule. "I don't know how to cook. 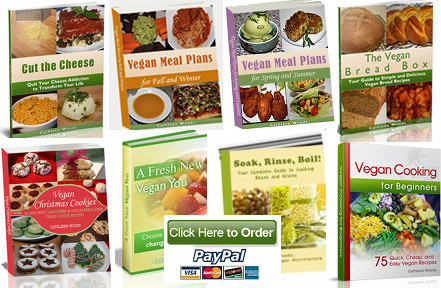 Vegan recipes have too many ingredients and steps." Many people I know never really learned how to cook. They can make instant rice and open cans of soup and they rely heavily on takeout food, but they don't feel comfortable enough in the kitchen to follow a recipe. 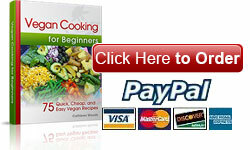 Cooking is largely about confidence and I have years of experience in making these really simple vegan recipes. These recipes are for high quality vegan meals without a lot of steps or complicated kitchen techniques. If you can read, you can cook these recipes. "I can't afford vegan food." In the last decade, vegan food has taken on the stereotype of being high-end and expensive. In the decades before everyone thought vegan food tasted like cardboard, so there's been an insurgence of gourmet vegan cuisine. But vegan food is just like regular food; some eat caviar with their champagne and others pack PB&J sandwiches with juice boxes. New vegans tend to gravitate towards the fake meat, cheese, and ice cream and focus on the frozen, boxed, pre-made meals, and those can be very expensive. They also can be packed with sodium, processed and refined ingredients, and often don't even leave you feeling full. I think fake meats are a nice gateway drug into the vegan world, but most of us veterans don't eat them anymore. Real, everyday vegan food is cheap. Dried beans and grains are just about the cheapest foods on the planet and they can fill up your family for months. A piece of fruit costs the same as a candy bar. A bag stuffed full of vegetables costs less than a fast food dinner. You don't need fancy, exotic ingredients to make a vegan dinner taste good. Unleash your inner cooking confidence with these quick, cheap, and easy vegan recipes. When I was a new cook, I had to look up cooking times for beans and grains all the time because I couldn't remember what was supposed to be 2 parts water to 1 part grain. Most beans and grains cook just about the same way, but there is a preferred way for each one, and this ebook covers all the details you'll ever need to know about how to cook beans and grains. I love this master vegan grocery list. All you have to do is print it out and stick it under a magnet on your fridge. When you need to add something to the list, just check off the food you need and take your list to the store. It's faster than writing everything you need every single week. 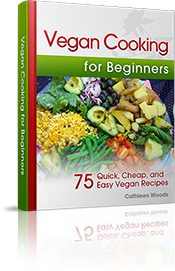 As soon as you click "purchase," you'll receive an email with the link to download Vegan Cooking for Beginners on your computer. You can store it on your computer or print it out. You'll also immediately get the download links for each of the free bonuses. You will need Adobe or another PDF reader on your computer. Adobe is free to download if you don't already have it. The book comes with a 100% no-hassle, risk-free guarantee. If you're not satisfied for any reason, email me and you get a complete refund. This option is best if you prefer to bring your iPad or Kindle into the kitchen with you to cook. You still get the money back guarantee when you order in one of these formats. Interested in a few ebooks?